If you would rather create your own itinerary, we would be happy to assist you in putting together one that best suits your schedule and interest. Then send us your requests, we will respond to you within 12 hours. Thailand is travel hub of Indochina. From Bangkok, direct flights are available to all the major cities in Southeast Asia, your trips can easily be extended to the neighboring countries Vietnam, Laos, Cambodia and Myanmar. Travel Thailand specializes in private & guided packages. Our travel consultants & tour operators at our Bangkok office will provide you with personal assistance every step of the way. Within 12 hours of your initial inquiry, our consultants will send itinerary suggestions and budget options based on your travel criteria. We are confident that your visit to Thailand & Indochina will be memorable and we look forward to welcoming you to Southeast Asia. 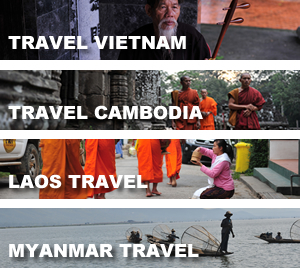 Indochina’s foremost active travel company designs journeys of comfort and authenticity to the most amazing destinations in the region. Best Tours, Service & Rates, guaranteed!